THERE WILL BE NO ACTION TAKEN on these bills unless there is public support for them. It is crucial that voters call or email their New York State representatives to urge support of these bills (do a search online if you do not know who your representatives are). Supporters should also use social media to further publicize this very important legislation. The Pace University Academy of Environmental Studies has published a comprehensive report that documents the inherent cruelty in training and the public safety risks associated with the use of these animals. The New York City Bar has published a report supporting both these bills. The Pace University and the Bar reports have been sent to all members of the Assembly and Senate Agriculture Committees to which these bills have been referred. The committees will only schedule hearings if pressured to do so by members of the senate and assembly. Call your representatives! While most people are not inherently cruel, they never ask themselves this basic question “How do they get those, elephants, tigers, lions et al to perform those ‘tricks’?” Unfortunately, the answer is “No animal performs because it wants to so the only way to ‘train’ them is via cruel, inhumane ways such as with chains, fire, bull hooks, beatings, withholding food and many other unacceptable practices. Not only is there a plethora of information on what goes on during the training of animals, there are also mind-numbing videos where the ‘trainer’ is encouraging an apprentice to “Beat him, make him scream! !” while pummeling an elephant with a bull hook! Look here if you have any doubts. If the average circus goer knew the means of training, they would see that animal circuses are not the innocuous, family-friendly tradition they are purported to be. The children, who go to the circus because they love the animals would be mortified. Not only is the abuse horrendous, it is on-going – the physical abuse as well as the emotional and psychological abuse suffered when wild animals are kept in boxcars for hours and hours on end. They NEVER get to live as in the wild where they constantly roam extensive ranges. They don’t receive adequate medical care and spend their time outside the circus ring in cages or chained on concrete floors. People seem to think that wild animals are trained the same as dogs but dogs want to do what you say so they get attention. They have been domesticated into wanting human love and attention. 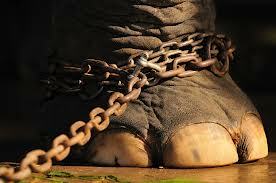 Wild animals have no want for this attention which means the only way to train them is cruel. Saying ‘aren’t you a good boy’ and stroking their head isn’t going to work on an elephant. I want to support this as I think all animal circuses should be illegal everywhere, but I live in the UK so I don’t have anyone to pressure. THIS IS THE BEST NEWS. HOPEFULLY ALL STATES WILL FOLLOW AND THIS WILL BE A CIRCUS FREE COUNTRY.